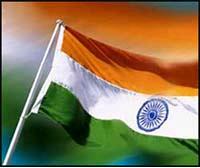 Vande Mataram is India's national song. A song that can move the hardest heart to tears, a truly inspired composition, in the fullest sense of the word. Today is celebrated as the marking of the 125th year of the song, composed by the Bengali poet Bankim Chandra Chatterjee. Here is the English translation of the song by Sri Aurobindo Ghosh who was a great mystic. Mother, I salute to thee! I can see why people of other religions don't like this song. It was actually used as an anti-Muslim chant during riots. Both the BJP and the Muslims are overreacting, though. Childish. > I can see why people of other religions don't like this song. Other religions as in: only radical Islamists. Kshitij, i went to a convent school and NOT ONE of us Hindus ever protested that we had to begin our day with prayers from the Bible/to Jesus Christ. I personally enjoyed it and till date read the Bible since it gives me a lot of insight. So even if the national song contained words like 'Lakshmi' (the Goddess of Prosperity), how does it matter. It's so foolish saying "that's their God, not ours". Dammit - there's just ONE God, only the name is different. Using this train of thought is saying "i would have sung the song had there been the word "Allah" in it. I find that logic distasteful". Moroever, the logic used to protest was not that it contained words like 'Lakshmi'. The logic was that "we do not bow to anything other that 'our' God, we cannot bow to the motherland". If you do not feel like bowing to the motherland, then i do not know where you will be if tomorrow someone attacks India in the name of 'your' God. > It was actually used as an anti-Muslim chant during riots. Let's say tomorrow, God forbid, someone killed people chanting "Jana Gana Mana". That just speaks for the inhumanness of the killer and not the anthem. Lastly, the law says that Vande Mataram is equal to Jana Gana Mana. Thankfully, the protest against the song was by only by a handful of radical elements and some useless arm-chair 'intellectuals" who got unnecessary press coverage. And you heard about the DMK idiots not attending the celebrations? Yeah, right : for someone who is giving 5-star treatment to a terrorist (madani), you can't expect anything else. Haha. Nice points, though. Both the fundies and the BJP are just using it to further their political agenda. >That just speaks for the inhumanness of the killer and not the anthem. Very true. It's just that some anthems/songs/texts/groups get tainted by association. The Communist Manifesto, for example, which is not a bad book and has a lot of sound economics behind it, but it's been tainted by its association with Mao and the USSR. Which is not a problem for most people, but asking radical elements or volatile groups to sing the song is just, well, stupid. The keyword here is CONVENT SCHOOL. Of course you weren't offended. Educated, rational people rarely are. I know five or six Muslim people from my school, and I talked to the parents of one of them, and they said that they had no problem with singing the song. Neither did the others. >Using this train of thought is saying "i would have sung the song had there been the word "Allah" in it. If fundies were that logical, the world would be a different place. My point is that yes, it's good to honor the song, but in the end it's just a song. We need to keep that in mind, because communal disharmony is an unacceptable price to pay. Most Muslims will have no objections, but the ones that do have problems are the ones most likely to get out on the streets and start rioting. Anyway, all that is over now. I wonder if the bomb blast yesterda had anything to do with this? > is this the full version? Which are the stanzas that Nehru decided to delete because it hurt Muslim sentiments? > Which are the stanzas that Nehru decided to delete because it hurt Muslim sentiments? All but the first two! That too, i believe, after Tagore intervened. But after independence, luckily Dr. Rajendra Prasad and others had their way. Man! I liked this post...had never really understood the song completely!